Note: This is a cross-post at WeAretheRealDeal.com today. There are only two things in this world that I’m really high-maintenance about. One is, obviously, food (though I’m getting muuuuch better about it/more flexible/more adventurous/less high-maintenance) and the other — the more critical by far–is my hair. The truth is, as a naturally curly red-head, I’ve struggled with my God-given color and ringlets since early childhood. I envied my friends who had poker-straight brown, black or blond hair. They could wake and go. They could get perms in the 80s, wear feathered bangs in the early 90s. And in high school/college, they could do the Jennifer Aniston ‘do. To boost my self-esteem (and, admittedly, to blend in more) in college, I started straightening it, frying the hell out of my hair. But that look wasn’t really “me,” either — though I admit, sleeker hair did help me feel more professional for my internships and, later, work. Because regardless of how I style it, my hair has always (funny as it may sound) “defined” me as me, for better or for worse. In my immediate family, we all have the exact same eye color, so my hair is the one physical trait that distinguishes me/makes me unique from them. 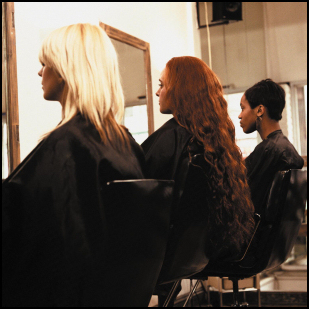 Plus, not many people aspire to be red-heads; most people want to be a blond or brunette … so even if I try to blend in by styling it one way, I still often stick out because of the color. So as you can tell, I’m pretty high maintenance about my hair. And if I’m having a bad hair-day, well, just be on the lookout. In fact, my dad lovingly/teasingly sometimes calls just to ask, “How’s your hair today, Lis?” knowing that I, like my mom, am very particular about my mane. Anyway, back to Salon Saturday and the rest of this meandering post. To cap off a very busy work week and to do something fun to pamper myself while my husband is out of town, I took a much-needed trip to the salon to get my hair cut and styled today. I arrived a little early and had some time to spare. So I did my favorite thing to do at airports and malls: I people-watched. Pacing near the hair products on display, they all that the same look across their faces, saying something like, “Yea, I might look like this now, but you just wait …,” knowing that within an hour or two, they’d have new highlights, a new cut, and a fabulous blow-out. I also noticed the freshly-cut and styled women at the counter paying, each one radiating and glowing, basking in her new ‘do. Some were in sweatshirts and jeans; some were in heels and skirts. It didn’t matter what they were wearing. Leaving the salon, they looked gorgeous. And though I hadn’t seem them walk in, I could only imagine that now, post-cut/style, they looked like more beautiful versions of their usual selves– and felt that way, too. So what is it about a haircut that can transform us? Make us feel so good about ourselves? Boost our self-esteem; give us a spring in our step? Because let’s be honest, I know I can never recreate a stylist’s work … yet I still always walk out feeling light on my toes and smiling. As I sank deep into the chair while my stylist massaged my scalp, I felt like a queen. I sprang for the deep conditioning treatment, had her lop off a couple inches and refresh my layers. And when I left, I walked out feeling light on my toes and, yes, smiling. With my confidence soaring, I couldn’t help but think of how something so simple (a few snips, some new products) can do so much for a woman’s self-esteem. And because it’s not something we do every day (especially in these tough economic times) it feels that much more special to treat ourselves to an hour of beauty bliss. It’s a feeling I will carry with me all weekend, and one I imagine the other women who hit the salon today will do, as well. How about you? Does getting a haircut give you a boost of self-esteem? omg lissa! i NEVER do anything with my hair, but for some reason today i decided to go bonkers and i got a perm! i had the same experience as you in the salon today. i feel like a milion bucks and i had fun with the salon people. YES my new hair is boosting me! this post was quite the coincidence! Isn’t it funny what that little bit of pampering can do?! I LOVE getting a haircut and style! I think it has something to do with being a woman, and women in general seemed to be quite “attached” to our hair. It’s a part of us that we can recreate at a moment’s notice, it makes us unique, and we don’t have to “work hard at it” to do something different.